For spring break this year I wanted to do Mexico. I have never been and now that I have a passport, I decided it was time to check out those white sand beaches. We had a wonderful time meeting people, hanging on the beach, practicing our Spanish, and dancing all around. We saw a circus show and a Latino-themed show at our resort. The shows had some amazing dance numbers including a quad-skating dance number. This was incredible impressive because they were skating and dancing, but also used props to propel themselves off the ground while the partner skates. It was something I had never seen before, and I was awestruck. I am also newly inspired to learn to merengue, it was so graceful and fast and beautiful to watch. Cancun was also not as affordable as I had expected. Our resort was all-inclusive so drinks and food and resort activities were included in the (hefty) price tag. I was given advice by some to bring US dollar bills for tips and also not to drink the water (only bottled water or purified!). We took note of all the suggestions, but still didn’t quite know what to expect. The peso is down, so you would think that things are cheaper. Strange thing about this place is that the American dollar is such a commonly used currency. You are constantly asked whether you want to pay in USD or pesos. Be aware of their “tipo de cambino” or their exchange rate because sometimes it is better than the actual rate and sometimes it is worse. I definitely overpaid a few times because I wasn’t quite paying attention. We stayed at the “Grand Oasis Palm” which we soon learned that this was the family resort and not the spring breakers destination resort. Honestly it was probably for the better, sure there were kids all around, but there were still tons of people our age and we got to relax a lot more. This resort was also the root of many inside jokes between us and our new friends. The motto of this resort family is “Oasis Loves You,” but the love is hardly felt because of all the hidden fees and lackluster service. We arrived at the hotel and were told we had to pay a $30 insurance fee because we were under 25. Also it has to be USD cash. Well okay… thanks for the warning. The food was decent, better some places than others. The lines to get drinks and food were always long, you had to tip if you wanted any service. It was hard to find or get bottled water anywhere. There were all these extras you could buy and everything was so expensive. We constantly talked about how we “love waiting in lines” and “we love to tip.” We laughed and joked around because we knew it was annoying and frustrating. Our friends were supposed to be in a different and nicer Oasis resort, but they had overbooked their hotel by 300 rooms and sent the rest of the people to ours. We bought a deal on Expedia which was a combo of visiting the Chichen Itza Ruins and also swimming with Dolphins. The Mayan ruins tour had pickup at 5am. I made it, but my friend Connor didn’t. We stayed up all night with out new friends and when 5am rolled around she was not having it. I went and luckily slept the three hours on the bus. It was really cool! The mayans had a lot of rituals related to the harvest, including some blood sacrifices. Their architecture skills were impeccable. 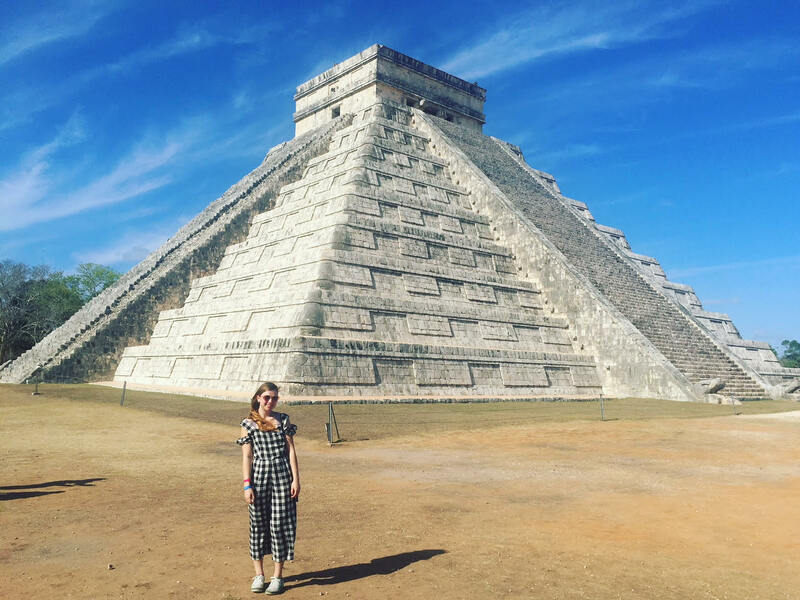 Every spring and fall equinox the sunlight creates this pattern down their mountain temple that has 7 triangles leading down to the bottom where there is snake head sculptures. 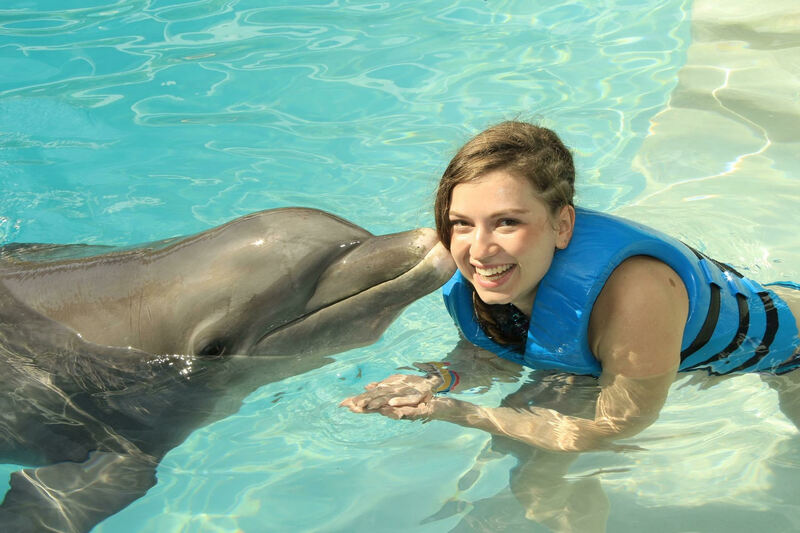 The dolphin experience was also pretty cute. I’ve never gotten to pet a dolphin, but they felt like a sharks leather, but a lot slimier. The dolphins were so nice and it’s something I’ve always wanted to try. We paid almost $100 to get our pictures from the dolphin adventure. We got a cd-disk and it was fine, I was going to put it in my laptop. But nah, my computer decides to eat the disk and we realize my computer has a dead CD drive and we will have to manually get it out later. We’re hoping there are pictures are actually on there. Note: My dad pried the CD out and we were able to download the photos on a different computer! One of the nights we decided to go to the clubs downtown. All of them included an open bar in the cover price which ranges from $60 to $100. We paid $65 to go to Mandala which played a variety of top 40 and electronic music. It was different than most clubs because it was all open at the front. You could still see the whole street that the club was situated on. We had taken a shuttle with some other people in our hotel and they gave us a table. It was so fancy, like we were getting table service. They brought us a bottle and these milkshake tasting shots, plus they kept refilling our ice. It was great service! Although later we learned that some of the guys in our group were tipping nicely, go figure. The morning we had to check out we made it right at check out time. Problem was they cut off your resort wristbands during checkout, meaning we couldn’t get food anymore. We got to keep them, minus this part with a number that they cut off. We took the sewing kit from our room and sewed them back on our wrists so we could go and eat still. It worked, and no one said a thing. The last difficult encounter we faced was getting to the airport. We had booked a super shuttle to take us there because it was cheaper than the taxi. Turns out we booked it for 4 days in the future and not for that day. We asked the front to call a taxi and they said it would be $25 usd or 400 pesos (equivalent to approximately 20 usd). We didn’t have anymore cash so I went to the ATM which only dispenses US dollars, charged me $5.80 for use, and a 10% “exchange rate commission fee.” It was a very expensive taxi (especially compared to our shuttle).